This painting representing a mid-winter sacrifice (blot), an evocation of Norse mythology, created a controversy. It is difficult to imagine that an inoffensive masterpiece by Carl Larsson (1853 – 1919), the artist who gave us Ett Hem, should have been targeted in any form of dispute and that morality should have been an issue. However, the vast mural, now at long last housed in the Swedish National Museum of Fine Arts, did unleash a debate and although commissioned for the Swedish National Museum of Fine Arts and completed in 1915, four years before Carl Larsson’s death, it was rejected. In fact, it did not adorn the prominent wall for which it was intended until 1997, when the Museum bought it from a Japanese collector who had purchased it at Sotheby’s in London, in 1987. Opinion changed when the fresco was borrowed from its Japanese owner for the National Museum’s bicentennial anniversary in 1992, the anniversary being dedicated to Carl Larsson. Public praise of the large fresco was such that the National Museum was motivated to buy back the mural and install it where it was meant to be installed in 1915. Domald took the heritage after his father Visbur, and ruled over the land. As in his time there was great famine and distress, the Swedes made great offerings of sacrifice at Upsal. The first autumn they sacrificed oxen, but the succeeding season was not improved thereby. The following autumn they sacrificed men, but the succeeding year was rather worse. The third autumn, when the offer of sacrifices should begin, a great multitude of Swedes came to Upsal; and now the chiefs held consultations with each other, and all agreed that the times of scarcity were on account of their king Domald, and they resolved to offer him for good seasons, and to assault and kill him, and sprinkle the stalle of the gods with his blood. And they did so. 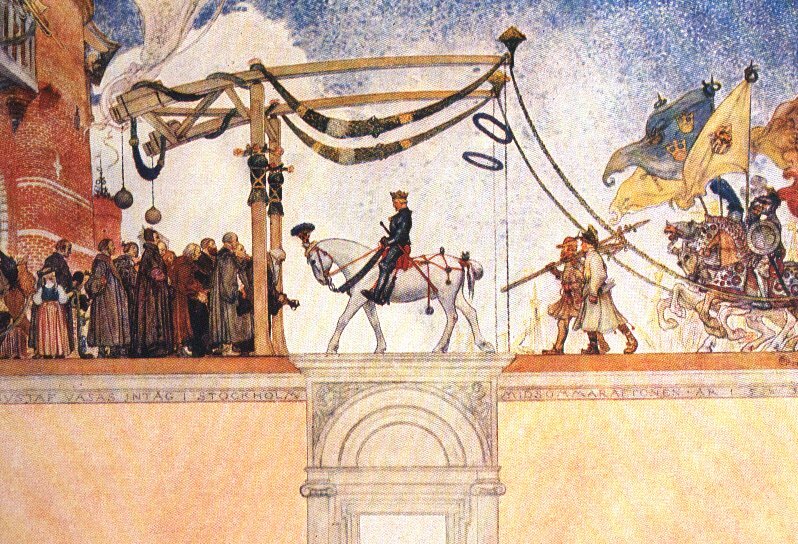 Midvinterblot was to contrast with a painting, by Carl Larsson, of Gustav Vasa’s march into Stockholm, in 1523, a midsummer theme. The rejection of Carl Larsson’s Midvinterblot was painful, but he had a refuge: Ett Hem, and he is now a beloved legendary figure. Real nice pattern and superb subject material , very little else we need : D.
Thanks , I’ve just been searching for info about this topic for a while and yours is the best I have came upon till now. However, what concerning the conclusion? Are you sure concerning the source? Thanks so much with regard to giving my family an update on this subject matter on your web page. Please know that if a new post appears or in the event that any improvements occur with the current write-up, I would be interested in reading more and learning how to make good use of those tactics you write about. Thanks for your efforts and consideration of other individuals by making this web site available. What i don’t understood is in fact how you are now not actually a lot more neatly-favored than you may be now. You are very intelligent. You recognize thus significantly with regards to this matter, made me in my view imagine it from a lot of numerous angles. Its like women and men don’t seem to be involved unless it is one thing to do with Lady gaga! Your individual stuffs nice. At all times deal with it up! I do accept as true with all the concepts you’ve introduced for your post. They are very convincing and can certainly work. Nonetheless, the posts are too quick for newbies. May you please extend them a little from subsequent time? Thank you for the post. Definitely believe that which you said. Your favorite reason seemed to be at the web the easiest thing to remember of. I say to you, I definitely get irked while people think about concerns that they just do not recognize about. You controlled to hit the nail upon the highest as neatly as outlined out the entire thing with no need side effect , folks can take a signal. Will likely be back to get more. Thanks! I have been browsing online more than three hours nowadays, but I by no means found any attention-grabbing article like yours. It is lovely value enough for me. In my view, if all site owners and bloggers made just right content as you probably did, the net will likely be a lot more useful than ever before. “Oh, that way madness lies let me shun that.” by William Shakespeare. I just couldn’t leave your web site before suggesting that I actually loved the standard information an individual provide on your visitors? Is going to be back regularly in order to investigate cross-check new posts. I have recently started a website, the info you offer on this site has helped me tremendously. Thanks for all of your time & work. “Americans detest all lies except lies spoken in public or printed lies.” by Edgar Watson Howe. You can definitely see your skills within the work you write. The arena hopes for even more passionate writers like you who are not afraid to mention how they believe. At all times go after your heart. “Faith in the ability of a leader is of slight service unless it be united with faith in his justice.” by George Goethals. Great post, I believe people should acquire a lot from this web blog its really user pleasant. So much great info on here :D.
Generally I don’t learn post on blogs, but I would like to say that this write-up very compelled me to take a look at and do so! Your writing taste has been amazed me. Thanks, very nice article. After study just a few of the blog posts on your website now, and I truly like your way of blogging. I bookmarked it to my bookmark website checklist and will probably be checking again soon. Pls try my website as nicely and let me know what you think. Great post again! Thanks a great deal. Outstanding post, I conceive weblog owners should learn a lot from this blog its really user genial . “My father always told me, Find a job you adore and you’ll never have to work a day in your life. '” by Jim Fox. I just want to say I am very new to blogs and absolutely savored you’re internet blog. Very likely I’m want to bookmark your weblog post . You surely come with awesome articles and reviews. With thanks for sharing your website page. Simply wish to say your article is as astonishing. The clarity in your publish is just great and that i can think you are a professional on this subject. Well with your permission allow me to seize your feed to stay up to date with drawing close post. Thank you one million and please continue the enjoyable work. I merely wanted to thank you one more time for the amazing website you have produced here. Its full of ideas for those who are genuinely interested in this subject, primarily this very post. You really are all so sweet plus thoughtful of others in addition to the fact that reading your website posts is a good delight with me. And what generous treat! Jeff and I usually have excitement making use of your recommendations in what we should do in a few weeks. Our list is a kilometer long so your tips will certainly be put to great use. Whatever you wrote makes sense. I am not feeling better as a result of my first date being captured into a camera after which published on youtube. I’ll be back soon to review your thoughts here. I also think our pass d is MUCH better this yr than it was last yr. Also, the strength of schedule is not even comparable. I hope you will be adding much more in the future. Best Regards. I was honored to receive a call from my friend immediately he identified the important guidelines shared in your site. Going through your blog article is a real fantastic experience. Thank you for thinking of readers much like me, and I hope for you the best of achievements as a professional in this field.